When President Obama was elected in 2008, he reaped 66% of the vote among Millennials, and in his re-election campaign last year, he came away with 60% of their vote. Obama isn’t going to be running again, but a new survey of young Americans’ attitudes conducted by Harvard University’s Institute of Politics suggests that 18-to-29 year olds now have a more negative view of his presidency. The survey, conducted Oct. 30-Nov. 11, finds that 54% of Millennials disapprove of Obama’s performance as president while 41% approve — an 11-point drop since Harvard’s April survey and the lowest approval rating for Obama among this group since he took office. (Harvard has conducted its surveys of young Americans 24 times since 2000). 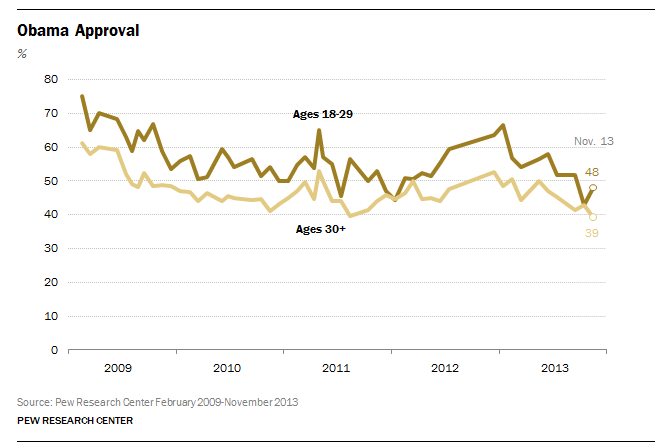 The level of disapproval is about the same (56%) for younger Millennials ages 18 to 24 and older ones (53%), ages 25 to 29. But his ratings have fallen in every subgroup, the survey finds. His approval rating among college students is down 11 points since last spring to 39%; among young male voters 9 points; and, among young female voters 15 points. Obama also suffered declines in approval numbers since last spring of 10 points among young white voters; 18 points among Hispanics; and 9 points among blacks. (However, his approval among blacks still stood at 75%). 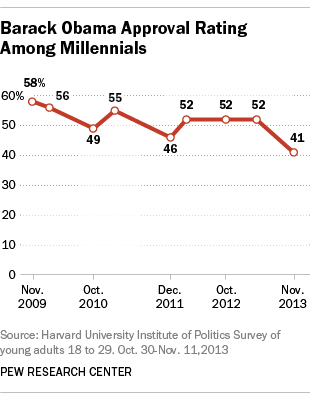 While the fall-off in Millennial support has attracted attention because that group has been a key component of Obama’s constituency, it is important to note that Pew Research Center surveys over the same period as the Harvard polls show his losses among 18 to 29 year-olds are no greater than in any other age group. In the Harvard survey, the drop in Obama’s ratings tracked a decline in the number of young Americans who believe the country is heading in the right direction. Just 14% of those surveyed said the country was headed in the right direction, 49% said it was headed in the wrong direction and the remainder was unsure. This trend was particularly pronounced among 18 to 29 year-old women. The survey also included findings on a range of issues, including mostly negative views on Obama’s health care law. As next year’s midterm elections approach, the survey found that younger Millennials, those under 24, were trending less Democratic. About 3-in-10 (31%) of this group identified with the Democrats, down from the 36% that did so in the last three surveys dating back to March 2012. A quarter of the younger Millennials identified with the Republicans. The share of older Millennials (25 to 29 year olds) remained fairly steady at 38% who identified with Democrats compared to 22% who sided with the GOP.